I was born and raised in Kathmandu, Nepal, and have spent over 20 years here. There are so many things to love about this developing, yet beautiful country. From the snow-capped Himalayas to the deepest valleys in the world, from the highest lakes to the densest population - what's not to love? Traveling to Nepal? Be sure to look for the industry-low cheap flights to Nepal and back. If Nepal doesn't bring a smile to your face every single day, you are a lost cause! Nepal is on the Forbes' list of ten coolest places to visit in 2015. With a reputation as one of the most beautiful places in the world, there are lots of opportunities to see some amazing sights in Nepal. This page will show you the breathtaking views Nepal offers - from the roof of the world to the deepest valleys, from the highest lakes to deepest gorges. On April 25, 2015, a devastating earthquake struck Nepal with its epicenter on this beautiful Barpak village. It is 77 km away from the capital Kathmandu and is a popular trekking village. Mount Machhapuchchhre (also known as Fishtail mountain) as seen from a small village called Sarangkot just above Pokhara. Machhapuchhre (a Nepali word) translates to "tail of a fish". The two summits of the mountain resemble the shape of a fish's tail, that's how this mountain got its name. The shape is more clearly visible when seen from Ghandruk, which is one of the stops in Annapurna trekking region in Nepal. Ghandruk is about 5 hours hiking distance far from Pokhara. Ghandruk trekking circuit can be a good start for beginner trekking enthusiasts. Trekking in Nepal is challenging, and you can prepare for more treacherous routes by starting with small. The best time for this 5 day trekking from Pokhara to Ghandruk is from September to May. This trekking season falls on the winter days when the mountains are covered with the whitest snow and your itinerary avoids the rainy days while including the biggest festivals of Nepal. You can't really talk about Nepal and not include the Everest. Standing 29,029 feet high from the sea, it offers challenging trekking to the base camp and even more dangerous route to its summit. The gateway to Mount Everest, the Lukla airport is equally challenging for its aviators and one of the most dangerous airports in the world. Nevertheless, more people are motivated to reach its summit every year. In his book Climbing Everest, George Mallory explains that climbing the Mount Everest is a way to live. We do not live to eat or to acquire wealth. What we do is just the opposite - eat or make money in order to live, to survive. For him, mountaineering and climbing are to live. He begins to explain that we get sheer joy from adventure, and this is what it means to live. This can't be truer when used in the context of Nepal. Mount Everest and the Mahalangur Himalayan range under the stars at night. Namche, the stopping point for Everest (Sagarmatha) trek is equally gorgeous. An almost 5-star travel guide! I have loved Lonely Planet's Trekking series for routes in Nepal. The other guide by Trailblazer contains specific well-known Himalayan routes only, so I found this to be much more useful. 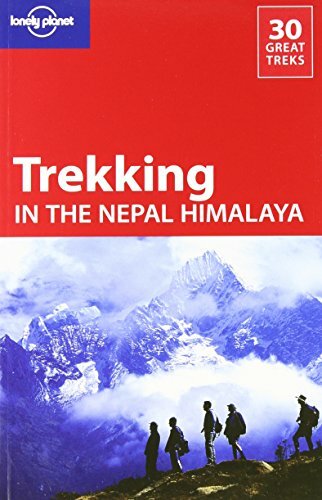 Because if for some reason, you can't go to trek around the Annapurna and Everest (dangerous routes), this companion guide book still has other small trekking and hiking routes which take you to some beautiful valleys and remote places in Nepal. A minor issue is that the paper quality is not good enough to withstand the constant wear and tear during the actual trek, but otherwise, it is 5 stars worthy. You will thank the writers for mentioning the locations of even the small tea shops and guesthouses on the trail. Honestly, this is the most beautiful picture of Pokhara I have ever seen! The above picture was taken from Sarangkot, which is about 25 minutes ride from Pokhara. Sarangkot is just 11 km away and is a perfect place to enjoy breathtaking scenes of the Pokhara valley and the Phewa lake below and the Annapurna range in the north. Another equally beautiful picture shows Pokhara from the hill of World Peace Stupa, just south of Phewa lake. It is the paragliding spot in Pokhara. Ann Abel from Forbes perfectly sums up the activities you will want to do at Pokhara. If you like peace and calm, a boat ride on the Phewa Lake (pictured above) will soothe you from inside while its pleasant water mirrors the magnificent Fishtail mountain and the Annapurnas will soothe you from inside. And if you are feeling particularly active, a hike to the top of the World Peace Stupa will give you the stunning view as above. Clear and transparent water. Doesn't it make you jump right in? Just for one day in a year, Pashupati temple in Kathmandu is visited by over 700,000 pilgrims all over from South Asia. Statistics shows that 115,000 out of the total visitors are from India alone. There is a tourist deck just east of the main temple premises from where one can enjoy the peace of Bagmati river and the Bankali forest around them. Mrigasthali (translates to "home to the deer") is a sanctuary on the eastern part of the Pashupati area which is home to spotted deer, barking deer and black bucks. No wonder it is listed as a UNESCO World Heritage Site. Pashupatinath Temple in all its glory on the day of Mahashivaratri (the birthday of Lord Shiva). Taken fron the tourist lounge area (visitors' deck in the east). A stunning panaromic view of Phoksundo Lake (Dolpo). Located on the remote western district of Dolpa, it is one of the highlights of Shey Phoksundo National Park. The national park is the largest and the only trans-Himalayan park in Nepal. It covers almost 2.5% land area of Nepal. Rhino spotting in Chitwan. I would give everything to enjoy a day's tour to see rhinos, tigers and crocodiles in Chitwan National Park. See? And you thought only cats were cute. Good. Let the "aww!" flow through you. A stunning capture of Siddhapokhari, Bhaktapur. The stupa with the largest single Chhyorten in the world stands 118 feet tall from its base. It is believed to have been built just after the death of Lord Gautam Buddha and was the center of ancient trade route between Kathmandu and Lhasa (in Tibet). Buddhists pilgrims revolve around this massive stupa enchanting their sacred song "Om Mani Padme Hum" and it is believed to bring peace, prosperity and spiritual well-being from within. Boudhanath Stupa in the evening light of the setting sun. Taken from one of the restaurants around Boudhanath premises. Last, but really not the least! Waiting for sunrise. This is taken from Nagarkot, on the northeastern hills of Kathmandu Valley. Yes, the land below the clouds is Kathmandu valley; and includes some areas of Shivapuri National Park. Barun valley is a very little-known tourist place in Nepal. It is located in a protected wildlife reserve - Makalu-Barun National Park. It shares its border with Arun valley in the west (which is the deepest valley in the world), with Tibet in the north and India in the east. As it lies just at the base of Mount Makalu (27,766 feet), the valley has a contrast in elevation and landscapes. High waterfalls, foggy mountains, snow-capped mountains, deep gorges and even tropical forests shelter in this beautiful mountainous ecosystem. Sorry, I'm on a roll! Manang is a place beyond the Himalayas. It is the least populated district of Nepal and a very weird thing is that there are no blacktopped roads. That is, the length of motorable roads is zero. Yup, Nepal is truly a weird place. However, it has much more to offer than zero. I'll let the following picture speak for itself. Manang on the foothills of Gangapurna mountain. 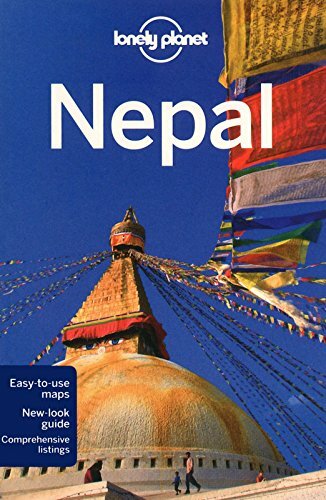 Lonely Planet's Nepal travel guide provides in-depth recommendations and information related to trekking routes, national park sightings and for wandering around Kathmandu and Pokhara. What it does not do is, in detail, show the challenges tourists have to endure in congested roads in Kathmandu. Public transportation reviews are not enough. The amazing experiences of traveling to Nepal - paragliding, ultralight flight over Pokhara and Annapurna, safari in Chitwan, walking around Boudhanath stupa. Just wow! Chicken Mo:Mo - the most popular and the tastiest Nepali dish. Never ever forget to try Nepali momos - they are nothing like dumplings. Wow, so many beautiful places in Nepal! I would love to visit the Chitwan National Park. The rhino is so cute! Hi, Great Complitation! A small request, can you please credit the picture no. 4 to photographer Samir Jung Thapa too? Thanks! Hey, thanks! The picture was taken from Flickr and there was no mention of the name. However, I checked for more photos about Great himalayan trail. Thanks, I have updated it and the changes should be seen within a few days. Great article and some lovely photos. Ive been lucky enough to visit Nepal 8 times. Of all the places I have visited it is BY FAR my favourite!! Beautiful people, beautiful mountains and beautiful mind-set. I just love the place!! Namaste. @Petehuskins Namaste!_/\_ Thank you very much, also for your kind words about Nepal. I'm sure you are eager to make your ninth visit too. Cheers! Who says only good karmas will take you to the heaven. You really don't wanna die now. OMG I wish I could express my feelings. Who says you can't express your feelings? You have expressed quite a bit already ;) Thanks for your comment! Images are just awesome,,,now Nepal is in must visit places list. Thanks for sharing and keep sharing such good stuff. Hi. Sure, I will. And yes, Nepal is very much a must see country. Thank You for stopping by. George Leigh Mallory Climbing Everest: The Complete Writings of George Mallory. London: Gibson Square Books Ltd, 2010.